One can imagine the shock that Luigi Galvani experienced in 1786 when seeing a dead frog’s leg violently contracting. Galvani had seen such contractions numerous times before, since, for the past decade, he had been conducting experiments using electricity to study physiological responses of the frog. But, on this day, his assistant used a metal scalpel to touch the exposed nerve of a dissected leg, which was placed on a table after being used in an earlier experiment. In a subsequent experiment, Galvani observed that when two different metals were placed in contact with a nerve or a muscle, an electric current was generated and the muscle contracted. Galvani, an Italian physician, anatomist, and physiologist, was a graduate and now respected faculty member at the University of Bologna’s medical school. On the basis of his experiments, he concluded that nerves and muscles contained an electrical fluid, which was analogous to electricity, and dubbed it “animal electricity.” He postulated that an electrical field was generated in the brain that passed in the blood from the nerves to muscles and was responsible for the contractions. Italian physics professor Alessandro Volta’s initial enthusiasm for Galvani’s animal electricity turned to skepticism and then outright opposition. Volta, who taught at the University of Pavia, accepted the results but (correctly) rejected the notion of animal electricity. He alternatively explained that when two different metals come in contact, a current is generated. He called this metallic electricity Galvanism. Both men influenced the future course of science and perhaps literature. Galvani’s experiments were among the first in electrophysiology (bioelectricity), the electrical properties of living cells, and Volta’s studies led to a voltaic pile, an early battery. The terms galvanize and the electrical unit volt are named in their honor. Among Galvani’s staunch supporters was his nephew Giovanni Aldini, a physics professor. Aldini continued his uncle’s experiments and in 1803 performed a widely publicized public demonstration of electrical stimulation of a deceased criminal’s limb. 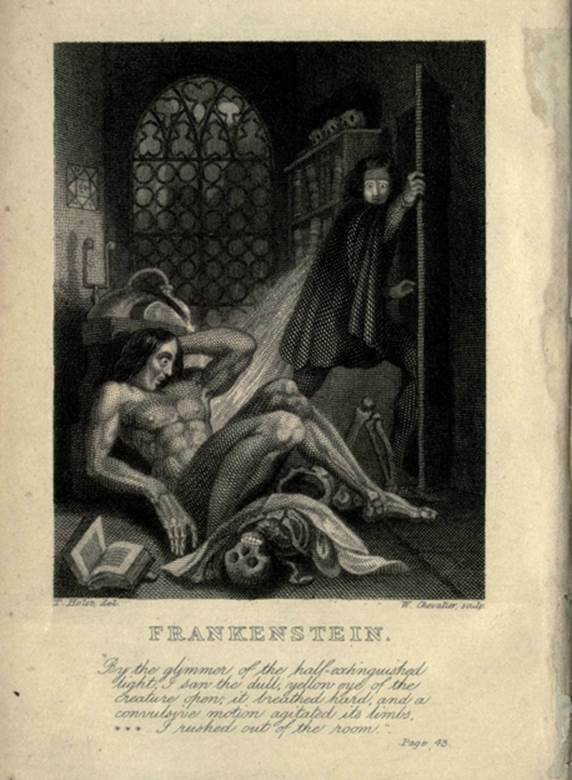 Although Mary Shelley left no record of this connection, it has been suggested that her Frankenstein (1818) was inspired by Aldini’s attempts at human reanimation. SEE ALSO: Nervous System Communication (1791), Action Potential (1939). An illustration of Dr. Frankenstein’s (unnamed) monster, from an 1831 edition of the work. The monster was animated by a powerful electrical current.